The Rosary Workout: New Website! Welcome to the new Rosary Workout website! There is a lot of information on this page, but I will be working diligently to better organize the site during the next few weeks. Thank you for your patience during this time of transition. What is The Rosary Workout? The Rosary Workout is a means to care for body and soul together. It is a goal-centered program focused on the integration of exercise, prayer and meditation to work the muscles of the spirit in harmony with the muscles of the body. The foundation of The Rosary Workout is the ability to meditate during exercise while using the science of interval training and periodization to continually challenge the muscles of the body. Rhythmic cardiovascular exercise at a moderate pace serves to open the mind to clearer thought and heightened awareness. The Rosary Workout uses this physiological response to exercise for a higher purpose, namely directing the clarity of mind toward meditative prayer. 1. A softcover book (and Kindle version), which is available at Amazon.com. To order, click on the book cover photo at the top of the right hand column where you may purchase the book, read reviews, and use the "Look Inside" feature as a preview. You can also purchase the book at Barnes and Noble or a variety of online Catholic bookstores. 2. An ebook download for $9.95 on this site (Click on the "Buy Now" button on the right-hand column.) After payment is received, your ebook will be emailed to you as a pdf attachment. (If you do not receive it within 24 hours, please check your spam folder first. If you still can't find it, please email me at peggybowes@gmail.com. The ebook file can easily be converted to be read on a smartphone, ipad, Kindle, Nook, etc. 1. What is The Rosary Workout? The Rosary Workout is a goal-centered, cardiovascular (aerobic) exercise program focused on praying the Rosary during a series of planned workouts. There are nine levels of progression. Each level is named after one of the Nine Choirs of Angels, part of Catholic tradition. The first three levels are designed for beginners, the middle three for intermediates and the last three for advanced exercisers or competitive athletes. Each level consists of specific workouts for four weeks and presents a different set of goals for both physical and spiritual growth. The book includes a comprehensive study of the Rosary and provides an overview of the scientific principles used in the development of the workouts. 2. Is this just about praying the Rosary while I exercise? No. This program is unique. The Rosary Workout incorporates the fundamental principles of exercise physiology. It applies the science of interval training and periodization to provide over 100 varied and challenging workouts carefully designed to improve fitness and prevent injury. At the same time, the program focuses on exercising the “muscles of the spirit” through Rosary prayer and meditation. 3. How much time does the workout involve? The initial time commitment is just 10-20 minutes twice a week. Although the program gradually increases the time commitment, you will continue to see results by exercising just 2-3 times per week. Intermediate and advanced exercisers who enjoy working out more often will find plenty of workouts to continue to challenge their fitness levels. 4. Do I have to join a gym? No. The Rosary Workout can be done outside (walking, cycling, hiking, etc.) or at home. The ebook includes suggestions to find a mode of exercise that is both enjoyable and beneficial. However, if you already belong to a gym or want to join one, there are additional suggestions to incorporate The Rosary Workout into your gym routine. 5. I haven’t exercised in years. Will the workouts be too hard for me? Definitely not. The first level of The Rosary Workout is designed just for beginners-- those who haven’t exercised regularly in the last six months, anyone recovering from an injury, pregnant or post-partum women, children under 16, adults over 65, or anyone under the care of a physician. 6. I’m a competitive athlete. Will the workouts be too easy? Not at all. The Intermediate and Advanced levels of The Rosary Workout provide ideal training plans for athletes. The workouts incorporate interval training and periodization, both familiar terms for most athletes. Additionally, athletes find that Rosary meditation during workouts helps sharpen their mental focus. 7. Is The Rosary Workout compatible with team sports? Sure-- if your team prays the Rosary together during practice. However, most team sports require too much focus and interaction to facilitate meditative prayer. The best type of exercise for The Rosary Workout is a repetitive form of exercise such as walking, cycling, running, swimming, etc. Of course, if you enjoy team sports, you can incorporate The Rosary Workout into skill drills or cross-training activities. 8. Is The Rosary Workout just for Catholics? Although The Rosary Workout is written from a Catholic perspective, the Rosary does predate the Reformation. Many non-Catholics are drawn to the Rosary by its meditative form of prayer and its Biblical origin. Anyone who incorporates the natural rhythm of the Rosary with the natural rhythm of cardiovascular exercise will likely be inspired by the experience. 9. What if I don’t know how to pray the Rosary? No problem! The Rosary Workout includes information on obtaining a Rosary and a tutorial on how to pray the Rosary. The text of all Rosary prayers and the Rosary mysteries are also included. Links to external websites embedded in the ebook provide information for further study. 10. I purchased the ebook but I forgot to save the file or I can't find it on my computer. What can I do? No problem! Simply send an email to peggybowes@gmail.com. I will be happy to send you a new ebook file after I verify that you purchased it or received it as a gift. 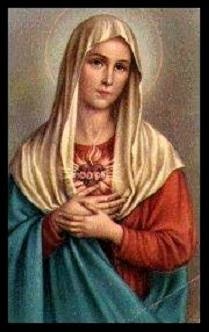 Please visit the terrific website, How To Pray the Rosary Every Day. This site has so much helpful content on meditation, resources and prayers. I was honored to be a featured Rosary presenter. You can read my interview at this link. "I have lost 10 lbs since Jan. 1st!! I just love how the Rosary Workout is changing my life!! Today, I flew to Chicago because my oldest is graduating from Navy Boot Camp. O'Hare is a huge airport and I walked through it without any problems. I am so happy!!! Thank you so much for your book!!!" "I am convinced that The Rosary Workout is appropriate for anyone, at any spiritual or physical level. I love that author Peggy Bowes has broken the workouts down into different levels in both of these areas. The Rosary Workout strengthens us both inside and outside and is a true blessing." I know that The Rosary Workout works! It’s the answer for anyone who feels they are too time-starved to fit both daily prayer and a regular workout into their lives. By combining the two, you not only accomplish both goals, but you give yourself two good reasons to get up and get it done – first because you need the exercise and second because, if you’re like me, it might be the only time of day you’ll get to pray the Rosary. The Rosary Workout ™ is comprehensive and fits people of all fitness and spiritual levels. As a fitness professional and a prayer warrior, Peggy Bowes has employed both of these rare talents to create a plan designed to strengthen both the body and the soul, making this the most complete and essential program on the market today. "I think it's great to combine exercise and prayer. I've read The Rosary Workout and it's a wonderful way to grow in your devotion to Our Lady and the Rosary while also caring for the Temple of the Holy Spirit, the body. It's a beautiful book that teaches beginners and those more advanced in prayer and exercise, how to combine both. It honors and promotes devotion to Our Lady. If you want to pray while you exercise, it's the perfect book!" "The Rosary Workout [is]a guide to a spiritual/physical workout combining prayer and exercise, in an integrated whole-person way. Peggy covers all the basics for body and soul, and I think it is worth the read for the busy mother who is interested in an integrated approach to physical fitness and the spiritual life." "Anyone who wants to add a spiritual dimension to an exercise routine may find this program to be just what they are looking for. We examined [The Rosary Workout] and it is well written and spiritually enlightening (even if you decide not to exercise). "I love that Peggy encourages readers to keep a journal that includes not only details about each workout, but also details about spiritual things. Did you go to Confession? Have you been struggling? Do you have a special intention? Tying my physical and spiritual health together in such a tangible way feels right in a way that excites me, that makes me, for once, WANT to work out." "How could I not at least test it out and try it? I could add spiritual growth and renewal at the same time as working toward continued health. I could use the extra prayer time. I could use a new way to lead me into deeper meditation. I could use some guidance from someone who clearly knew fitness. So I tried it. The workout is very well laid out and designed. It can be for the most beginner of beginners, the postpartum mom who is ready to get moving a little more and for those of us in the frigid Midwest it will be wonderful to keep up with in the winter months too. It can be simply implemented with or without exercise equipment (elliptical, recumbent bike, treadmill,etc.) or used just plain old walking or jogging. Pretty versatile and easily accessed. No excuses or limitations." "As a busy mom of six, I have been trying to improve my spiritual and physical health for years. I've ready many books and bought numerous videos but none were the right fit. 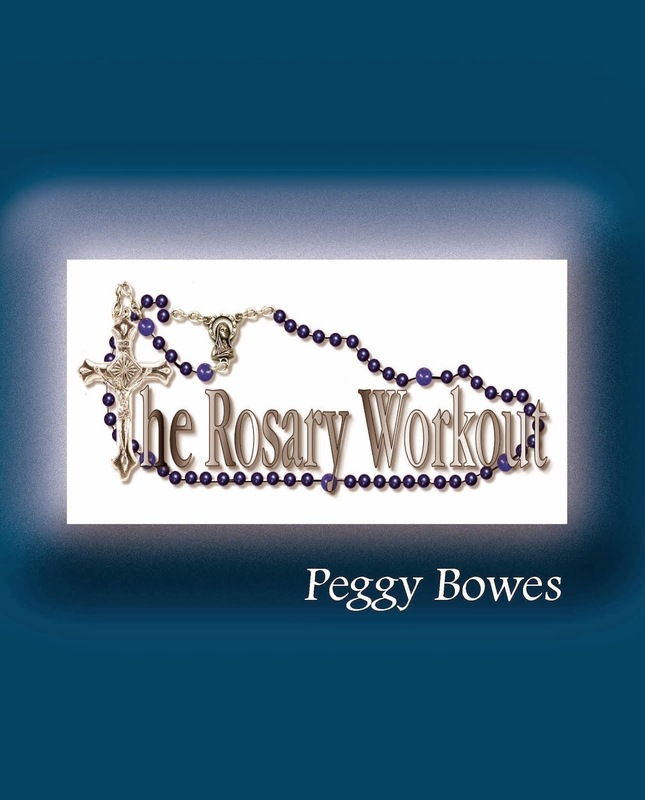 Peggy Bowes' The Rosary Workout has proved to be a practical, thorough and effective means of enhancing my spiritual life as well as my physical health. The integration of the physical with the spiritual makes this no ordinary exercise program and no ordinary prayer method. Bowes offers practical tips, personal encouragement and mulitple resources that result in success." 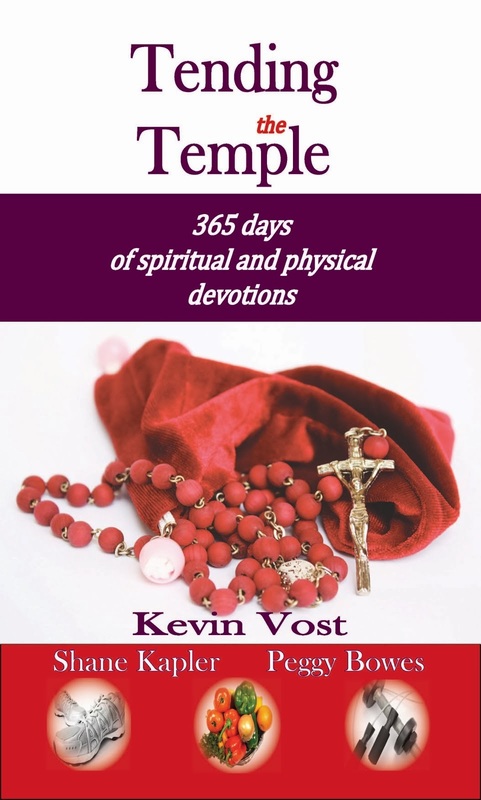 I like your new site Peggy and have been a fan of the Rosary Workout for a number of years and look forward to getting your new book Tending the Temple. Is the Rosary workout available on dvd? Interesting form of workout, being healthy and fit is a great feeling, physically and mentally! This is so amazing. I have a rosary business at www.cordbands.com and we specifically make rosaries for unusual conditions. Many of our customers (mostly men) are in the military. We also have customers that are distance runners, marathon runners, and ultra runners that pray our Rugged Rosaries when they run. I often get emails from people that want a rosary that will withstand their work outs and I hope you don't mind if I also refer them to your website here. So glad I found it! Keep up the good work. Workout is important part for exercise everyday. We have done different types of exercise daily to build our body fit, But workout is the best option to build muscle & it works for full body. In the market there are different types of workout machine but you have to choose the best which are comfort with. I just read this blog & found very good tips for workout & for that I really appreciate to this admin & really thanks for this blog. Such an informative and useful post you have shared here with us. I really like the tips you have shared here for us. Thanks and keep sharing. I'm amazed, I have to admit. Rarely do I encounter a blog that's both equally educative and engaging, and let me tell you, you've hit the nail on the head. The issue is something that not enough men and women are speaking intelligently about. I am very happy that I found this in my hunt for something regarding this. I have been praying the Rosary every day since June 12, 2015. I am a non-Catholic who started having Daily Communion at home with my wife in November 2012 and our encounters with the Lord in Communion led me to my evening 'Rosary prayer walks'. a month ago I joined Planet Fitness and have been combining the Rosary with my work-outs as well as my evening prayer walks. I started out doing the cardio circuit training and then we ran into a couple who gave us some wonderful direction - but whatever my 3x a week work-out at the gym, it is always the creative challenge to keep my heart focused on the Rosary while doing physical exercise! And now I have found you! Amazing grace! Love to you and your readership - thank you for your posts! This is the best article I ever found about workout. If we're making our Rosary as our daily workout habit, I'm sure whatever your needs in your lifetime goal, will be achieved as well. Thanks for this. This makes sense! This is just what I was looking for to help me find balance in my life. I have been in a bit of a funk recently, both in body and in spirit. I blame it on the short days. Reading this gives me hope that I will be able to get back into the swing of things and have my muscles and soul feel better. I'll immediately grab your rss feed as I can not find your e-mail subscription hyperlink or newsletter service. Do you've any? Please let me realize in order that I could subscribe. Thanks. I have just read lts web portal about the elevated panorama of home gym equipment and resistance training and the training schedule given by legandary person is inepressable in word. If you want to be take part of that of trx training course you will have to visit its web portal. Must say, very impressive post. Thanks for sharing post about Spirit motorised treadmill…!!! Good quality contents. Keep posting. Regular exercise would be the good source for physical source.. Thanks for sharing..
Is this workout work for full body? I am interested in doing this Rosary Workout. I got some beautiful information in your post that's why I asked this question. I do other exercise and I want to add this one in my daily exercise routine. be a great way to do both. Just like fitness should be a daily habit, faith should as well! I love it! How about is I have to reduce arm fat? Can Rosary work out help me doing this as well? The main service that Bruce Drago Workouts provide as a professional fitness guru is designing fitness and nutrition programs custom-fit to the needs of specific clients that are meant to keep them ... These programs are made up of fat-reduction, body-sculpting, conditioning, boxing, and kickboxing routines. Thanks for sharing nice information about workouts . Thanks for sharing, your article is very informative about fitness . Nice info on Rosary Workout. Meal Prep Delivery Los Angeles is a best place from where i order my prep meals. Whoever makes at least one Rosary Prayer daily without fail will never be doomed...! Thanks for sharing such a nice article Exercise . Nice fitness blog. By promoting behavioral and lifestyle changes, we help you integrate exercise and nutrition into your daily life. Incredible Workout Routines specially For Women, and a great tips on Weight Exemption . This article is really effective and useful thank you..
Good post thanks to sharing.. 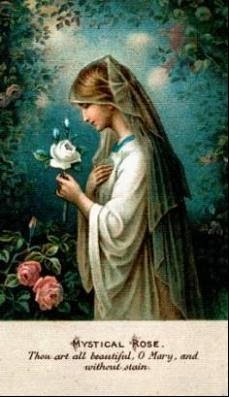 I am a devout Catholic who is very devoted to the Blessed Mother and her favorite prayer, the Rosary. I'm a US Air Force Academy graduate and former instructor pilot. After leaving the military to raise a family, I pursued my passion for fitness as a personal trainer, Lifestyle & Weight Management Consultant and aerobics instructor. I am also very active in parish life and have been a lector, CCD teacher, and Little Flowers Girls' Club leader. I enjoy triathlons, hiking, adventure races, and other sports as I incorporate all the benefits and blessings of my book, The Rosary Workout.